Solid Surface Countertops For Your Kitchen? Home / Solid Surface Countertops For Your Kitchen? Every kitchen must have a counter on which most of the work and cooking is done. It is an area of strenuous activity. What with all the hacking, chopping, cutting, slicing that is always taking place, the surface comes under some serious amount of exposure and this might weather it down pretty fast. A solid surface countertop in a kitchen is thus, a must for every solid kitchen that sees any cooking on it. One might readily ask the question so as to why a solid surface as opposed to a granite one maybe. There are points of advantages and disadvantages of both of course but even then, a solid surface might prove to be the eventual winner if we consider its relative inexpensiveness. Solid surfaces have been doing the rounds of kitchens for several years now and they have proved to be very durable. Made out of resin and polymer, their uniform smooth surface that is devoid of any sort of irregularities such as folds, lines or ridges, means that there is no scope for any sort of biological growth whatsoever. They are vulnerable to heat and chemicals though and these are the things to watch out for. 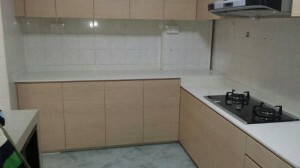 The chief reason why solid surfaces are preferred for kitchen is their value for money aspect. They cost less and have remarkable durability. They are also very easy to protect, clean and maintain, staying solid for many, many years. Advancements have been made and certain solid surfaces that were usually made of polyester and resin have acrylic too as a constituent. Above all, the main advantage that a solid surface comes with is its durability as well as its easy maintenance. Keeping the surface clean is possibly the only priority that needs to be fulfilled daily. A clean surface is sufficient to ensure that any food kept at it will be safe. Besides this, any cut or scrape that might have occurred on the surface can be righted without much of a fuss by just using sandpaper. It further helps that solid surfaces are usually packaged along with a warranty of ten years! You might be interested in granite countertops vs solid surface countertops too. Heat is one of the major concerns and perhaps one of the very few ones that one has to be careful about while dealing with these solid surfaces. The surface being made of substances that can react readily to any sort of high amount of heat makes it a bit vulnerable to it. Solid surfaces are very customizable, can be shaped and colour in various ways and patterns to suit one’s taste. This fact is delightful as also the availability of so many options so far as the prices go to suit everyone’s requirements. Solid Surface Countertops- The Best and the Most Popular.